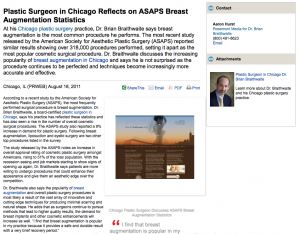 At his Chicago plastic surgery practice, Dr. Brian Braithwaite says breast augmentation is the most common procedure he performs. The most recent study released by the American Society for Aesthetic Plastic Surgery (ASAPS) reported similar results showing over 318,000 procedures performed, setting it apart as the most popular cosmetic surgical procedure. Dr. Braithwaite discusses the increasing popularity of breast augmentation in Chicago and says he is not surprised as the procedure continues to be perfected and techniques become increasingly more accurate and effective. According to a recent study by the American Society for Aesthetic Plastic Surgery (ASAPS), the most frequently performed surgical procedure is breast augmentation. Dr. Brian Braithwaite, a board-certified plastic surgeon in Chicago, says his practice has reflected these statistics and has also seen a rise in the number of overall cosmetic surgical procedures. The ASAPS study also reported a 9% increase in demand for plastic surgery. Following breast augmentation, liposuction and eyelid surgery are two other top procedures listed in the survey. The study released by the ASAPS notes an increase in overall approval rating of cosmetic plastic surgery amongst Americans, rising to 51% of the total population. With the recession easing and job markets starting to show signs of opening up again, Dr. Braithwaite says patients are more willing to undergo procedures that could enhance their appearance and give them an aesthetic edge over the competition. Dr. Brian Braithwaite completed his undergraduate degree program at the University of Chicago and his medical education at the University of Illinois College of Medicine in Chicago. After a surgical internship in Chicago, he served as a flight surgeon in the United States Navy. Dr. Braithwaite completed his residency in General Surgery at Keesler Medical Center, Keesler Air Force Base and his Plastic Surgery residency at the University of Louisville. He is a board-certified plastic surgeon, a fellow of the American College of Surgeons, and a member of the American Society of Plastic Surgeons. Located at 601 West Randolph Street in Chicago, IL, Dr. Braithwaite’s practice, The Aesthetic Institute of Chicago, can be contacted at (312) 361-8108. They also can be reached online via their website drbraithwaite.com or facebook.com/plasticsurgeonschicago.